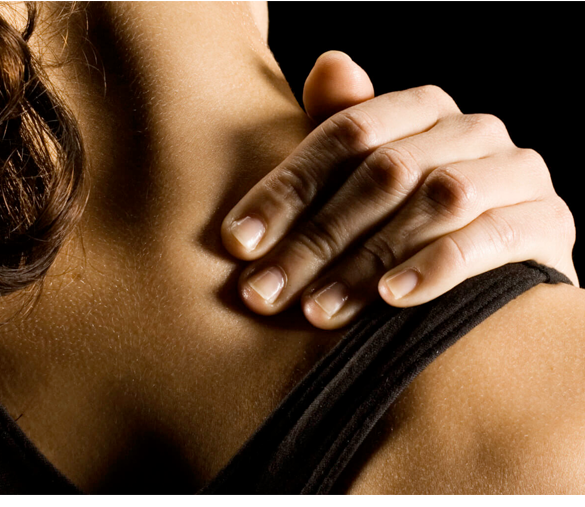 Safe, effective treatment for acute and chronic pain. Myofascial Acoustic Compression Therapy (MyACT) is used in the treatment of acute and chronic pain in muscles, tendons and joints. 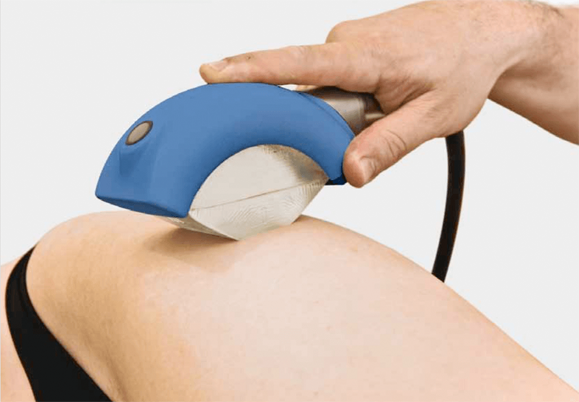 MyACT uses acoustic waves to target tissues at varying depths by compressing and manipulating the tissue, resulting in a focused, precise deep tissue massage, resulting in improved circulation and pain relief. Acoustic pressure waves are characterized by a pressure surge with an extremely short rise time, which is then followed by an exponential drop in pressure and a brief phase of negative pressure. The pressure waves used in MyACT applications focus or develop in the target tissue at the point where the pain originates. Many types of focused soundwaves have been used in the eld of medicine with great success for more than 20 years. 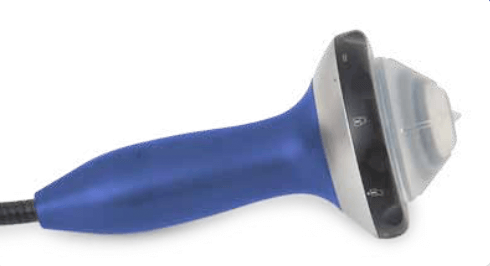 Based on a high level of evidence, Richard Wolf GmbH – a manufacturer of lithotripsy (ESWL) and orthopaedic (ESWT) devices – has specfically designed Piezo therapy sources to generate low energy/low pressure applications for the treatment of myofascial and musculoskeletal pain. Acoustic pressure waves are mechanical waves that result from the back-and-forth vibration of the particles of the medium through which the sound wave is moving. A MyACT single pressure wave is characterized by an acoustic pulse with a spatial expansion and a very short rise time of only a few nanoseconds. After a few microseconds, the rise is followed by a brief period of negative pressure, after which pressure returns to normal again. 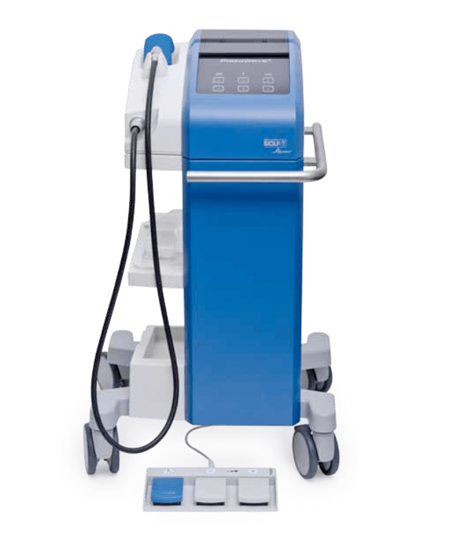 The PiezoWave2 MyACT system offers a choice of two piezo therapy sources: the Focused Therapy Source for pinpointed, focused treatment and the Linear Therapy Source for the treatment of larger areas. Both can used for the localization and treatment of pain points. The focal zone is the area where the pressure waves steepen to create a maximum mechanical pressure on the tissue in the area. The area is treated in such a way that pressure waves are generated precisely in the target tissue with the requisite amount of energy, resulting in only minimal trauma to surrounding tissue. The focal zone of a linear focused piezo source has an area of 46 mm x 20 mm x 4 mm. The direct focusing technology of the MyACT system means that the size of the focal area barely changes, even when the intensity settings are adjusted. The penetration depth of the focal zone is pre-selected using gel pads of different thicknesses. A special feature of linear focused pressure waves is that users can also select a “0” gel pad. Half of the focal zone remains within the gel pad, ensuring that the peak pressure in the middle of the focus forms precisely at the skin’s surface. The Linear Therapy Source option for the PiezoWave2 MyACT is ideal for treating larger areas. Richard Wolf GmbH and ELvation developed this linear, focused pressure wave to create a more uniform and more effective focal area. Gel pads are used to adjust the penetration depth to a depth of between 0 and 20 mm, ensuring that the acoustic eld is optimally adjusted to MyACT applications. Piezo ceramic crystals are arranged in a mosaic pattern on a concave transducer. A high-voltage current excites the piezo crystals, causing them to expand simultaneously along their axes to create a pressure wave. The piezo elements are aligned precisely to the therapy focus. The precise, focused and nonlinear dissemination of the pulse results in steepening at the point of focus, creating a high pressure. The Piezo MyACT system does not require an additional reflector. Treatment is quiet and virtually pain-free, and the technology allows the intensity levels to be freely adjusted with almost no impact on focal size. Piezo technology is extraordinarily durable. Years of research have shown that mechanical forces including tension and compression greatly influence cellular functions such as gene expression, cell proliferation and differentiation and the secretion of matrix proteins. Cells use mechanotransduction mechanisms to convert mechanical signals into a cascade of cellular and molecular events. Tenocytes in tendons, broblasts in ligaments and skin, osteocytes in bone, chondrocytes in articular cartilage, and andendothelial cells in blood vessels are mechano-sensitive and respond to mechanical forces. 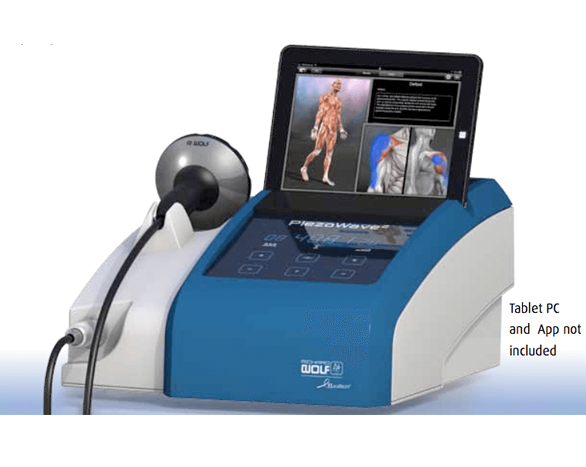 Acoustic Compression Therapy’s impact with its pinpointed delivery of mechanical stimuli can generate biochemical events that lead to improved circulation and pain relief -- key components in the healing process. 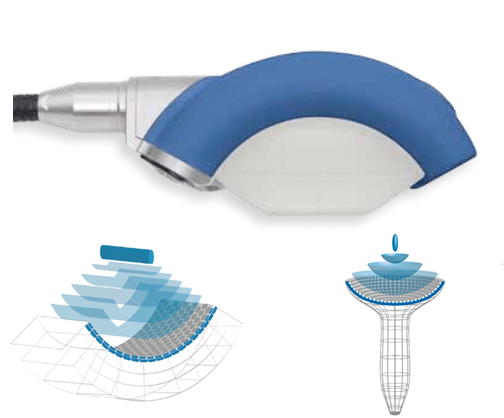 The PiezoWave2 has an improved user interface making it simple to use in daily clinical practice. Plug and play therapy source recognition means adjustments are carried out with a few keystrokes. Additional support is available from the optional Trigger Point App for your iPad. You can continue to receive the latest information on settings and the newest recommendations for PiezoWave2 clinical applications quickly and online. 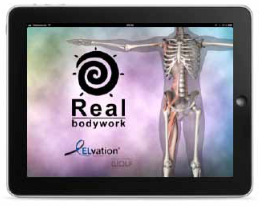 The Real Bodywork Trigger Point App is available from the App Store or Google Play Store. 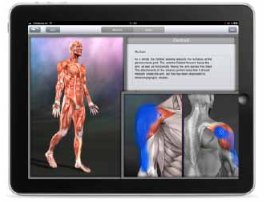 The App shows more than 100 trigger points and the areas of referred pain they create.